I knew I wanted to do a t-shirt fundraiser, but really just couldn't figure out what I wanted them to say. I knew I wanted them to be perfect. So I thought. And prayed. And thought. And prayed. And thought. And prayed. And about three months later, I was thinking about waiting and how it was all going to be WORTH it once Jack Cruz is HOME, but how I needed to cherish this time waiting as well. And it hit me immediately. And immediately I was in LOVE! But, God also assures my heart that He has made EVERYTHING BEAUTIFUL in ITS TIME. And as much as this wait has pained me, I can also see the beauty in the waiting. I see how he's drawn us closer to Him as we have had to FULLY RELY on Him. I see all the AMAZING friends we have made along this journey who have become people I couldn't even imagine living without. People who not only love me and my family, but a child half-way around the world that none of us have laid eyes on. 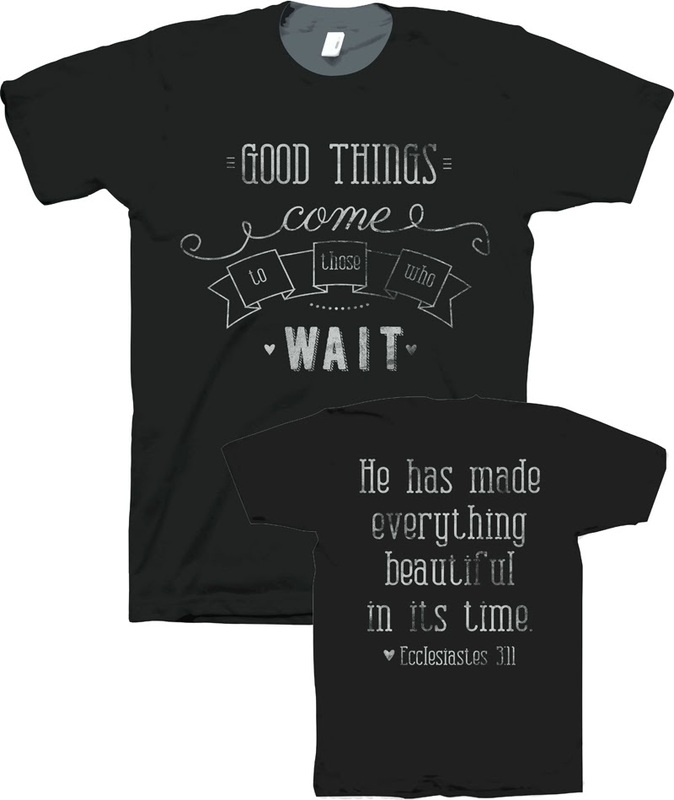 I cannot tell you how excited I am about these shirts! They mean so much to me and I hope they are inspiration to those not only going through the adoption process, but anything in life that they are having to sit still and wait on God to move BIG! and you will want to eat, sleep, workout, and go to your best friend's wedding in this tee! They are offered in sizes child xs- adult xxL. FREE SHIPPING to all continental US. I will be taking orders through Nov 27 and all shirts will ship in time to gift for Christmas!! All sales will go to help bring Jack Cruz HOME!!! a patient friend who helped me articulate to the last detail the design that was in my head! YOU- for helping us bring our baby HOME! God sending me the perfect design to encourage and bless my heart-and hopefully those around us too! Hi! I just purchased a shirt, but like a few others said, I did not see a place to indicate size. I would like an Adult Medium! Thank you and blessings to your family!! Ashley T.
Do you know if they run pretty true to size? I plan to order one for me and one for my daughter! Brooke, my husband purchased this shirt for me for Christmas and I just love it! What a creative way to help fund raise. I didn't see the post my friend Kim shared regarding the shirts so it was quite a surprise. We almost adopted from Korea but God had other plans for us. We will be praying for you on this amazing journey!